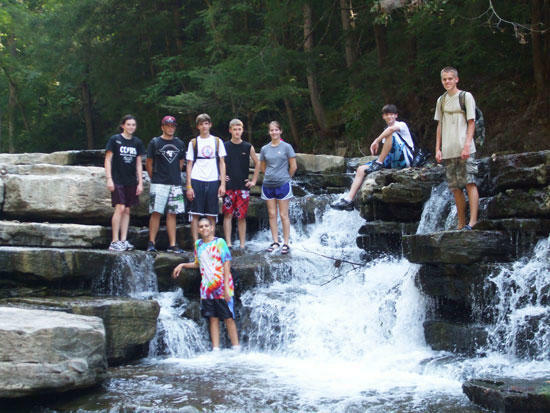 The CCHS Outdoor Club hiked down Spring Creek Gorge Labor Day weekend. Spring Creek is part of the Roaring River watershed north of Cookeville. In the summer this spring fed creek becomes a wonderful hike with plenty of swimming holes and water falls. In the winter and spring the creek becomes a lively, class III kayak and canoe run through the gorge. Hikers included Wes Alexander, T.J. Paul, Brock Francis, Franny Jenkins, Clay Luker, Hannah Faulkner, Umar Rasul, Brandon Harper, Doug King and Marc Larson. Anyone with questions concerning the Outdoor Club and trips can contact marcus.larson@dtccom.com.